This work addresses international concern about the harm which may result from environmentally hazardous activities. It embraces traditional transboundary harm originating in one country and affecting the territory of another country and includes global transboundary harm occurring when the sources of pollution and the potential damages are so widespread that it is impossible to point out either a single responsible State or a single injured State. Rules relating to environmental harm may be found at the level of international responsibility for wrongful conduct, the level of international liability for injurious consequences arising out of acts not prohibited by international law and the level of domestic or uniform rules on civil liability for hazardous activities. While there is a need for a more appropriate legal framework this book does not purport to give definite solutions to open questions. 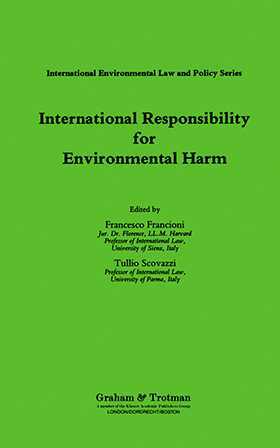 It describes legal tools presently available for dealing with the consequences of international environmental harm, and tries to focus on some specific risks or accidents, as well on some aspects of international cooperation.